Speaking about bridges, the Italian writer Erri De Luca, who was himself once a bricklayer said: “The Bridge is the only building work that is generous and social (cordiale). Instead of dividing [like walls], it wants to unite, to connect, to span over rivalry”. Undoubtedly one of the most famous bridges in the world, Florence’s Ponte Vecchio was built in 1345, though there have been bridges at this crossing point of the river arno since roman times (flooding put paid to each of them). The bridge is famous for the shops it hosts; initially these were largely butcher shops, fish mongers etc because being on the bridge allowed them to dump their rubbish directly into the river! When Cosimo I de’ Medici had the Vasari corridor built, in 1545, which passes over the ponte vecchio (and which features in Dan Brown’s blockbuster Inferno, he had the meat market moved from the bridge so that its offensive smell wouldn’t enter the corridor. The goldsmiths and jewellers that trade on the bridge nowadays were then installed. Venice obviously has to feature in the list, and there are many candidates – like the bridge of sighs, the Ponte dell’Accademia, or the city’s newest bridge the Calatrava Bridge – but our favourite and perhaps the most famous is the Rialto Bridge which spans the Grand Canal. Most famous because of its grand architecture – designed by Antonio Da Ponte in 1588, winning against submissions by other famous artists including Michelangelo – but also because it is at the heart of the busy rialto market area [remember shylock’s ‘meet me on the rialto’ from The Merchant of Venice]. It’s an amazing experience, to wander the small narrow streets, feeling disorientated and lost, and to emerge out into the relatively spacious rialto bridge (despite the scrum of tourists and memorabilia shops) and view the Grand Canal. 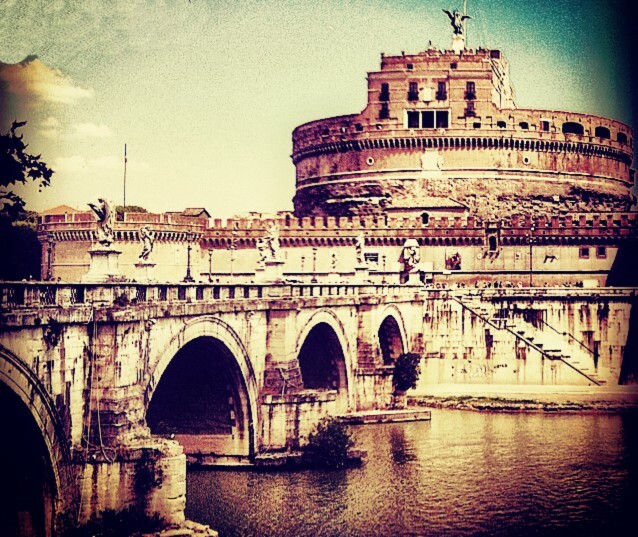 On its own the Ponte Sant’ Angelo in Rome is impressive, with its sculptures of angels by the likes of Bernini, but combine that with its view onto the Papal fortress of Castel Sant’Angelo (the mausoleum of Hadrian), and you have something really special and otherworldly. The bridge has roman origins, originally being called the Aelian Bridge or Pons Aelius from 134 A.D. With the adoption of Christianity by the Roman Empire, the bridge became known as the Bridge of St. Peter, as it was the main route for pilgrims to get to St Peter’s Basilica, but in the 7th century, under Pope Gregory I both the castle and bridge became known as Sant’Angelo; legend claims that, during a plague, Gregory led the faithful around the city in prayer, and when they approached the castle he had a vision of the archangel Michael, on top of the castle sheathing his sword – a sign that the plague would finish. There are plenty of other stories relating to the bridge – not surprisingly, given its location and age. A wonderful bridge. 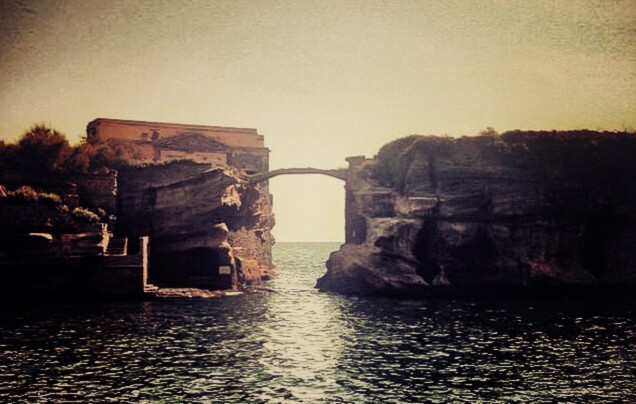 Situated within swimming distance of the shore of Naples’ Posilipo neighborhood, Gaiola is actually two tiny artificially created islands, connected by a small and desperately romantic bridge. The Island is known locally as the cursed island, as many of its owners (there’s space for just one villa) have met a grisly end. The bridge and island are picture-postcard-perfect, and nowadays the area surrounding the island makes up an underwater marine park protected by the Campania region. 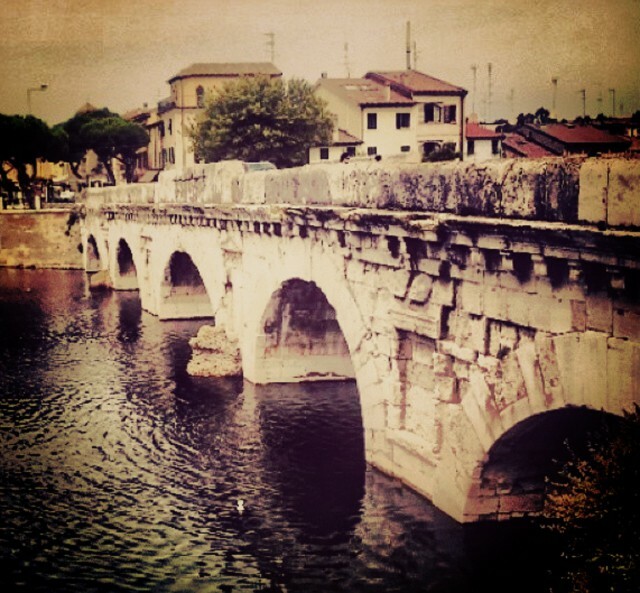 The oldest of our collection of bridges, Rimini’s Ponte di Tiberio this magnificent Roman bridge was built during the reign of the Emporor Augustus, starting in 14 A.D, though it was finished several years later, during the reign of Tiberius (hence the name) in 21 A.D. What’s remarkable about the bridge, aside from its impressive width and solidity – made from Istrian marble it has withstood wars and floods admirably – is that it is still in use today, connecting Rimini’s busy centro storico with the trendy Borgo San Giuliano district. The Ponte della Maddalena (Bridge of Mary Magdalene), in Borgo a Mazzano, also known as the Devil’s Bridge [though to be fair, there are loads of bridges in Italy known locally as the ponte del diavolo was an important crossing point on the medieval pilgrimage route the Via Francigena which brought pilgrims from France down to Rome. It was built in the 11th century by Matilda of Canossa, and is remarkable for its asymetric arch. It has survived through the centuries, with minor reconstruction work and the addition of another arch in the 1900s. 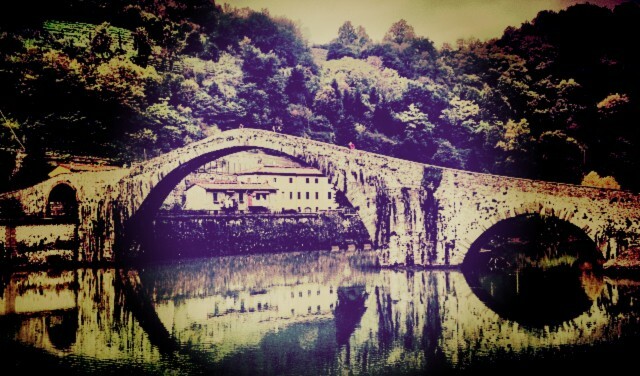 A bridge that crosses the river serchio, but also seems to span time – well worth visiting. While the other bridges in the collection are, in many ways, testament to time and man’s ability to dominate and shape his environment, the Tibetan bridge that spans the San Gervasio gorge in Piedmonte is a more modern entry that highlights what the bridge crosses more than the bridge itself; billed as the longest Tibetan Bridge in the world (the main structure is 468metres long suspended in the air above the gorge), and was built in 2006 connecting the comunes of Cesana Torinese e Claviere.